Beautiful view of the Tooley Street fire - the greatest fire since the Great Fire of London. 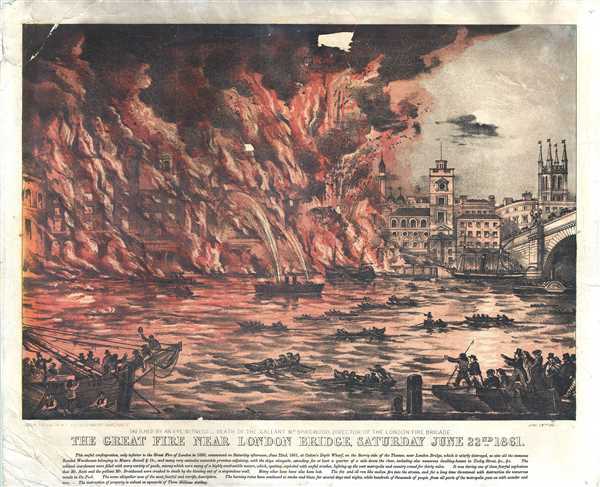 The Great Fire Near London Bridge, Saturday June 22nd, 1861. This is a remarkable view offering an eyewitness’ depiction of the Tooley Street fire in London on June 22nd, 1861. The view features the Cotton’s Wharf and surrounding buildings engulfed in flames. In the foreground, crowds gather to watch while men can be seen pointing towards the blaze. Boats can be seen rowing away from the fire. A steam fire engine and a floating engine attempt to douse the flames. London Bridge can be seen in the far right. This awful conflagration, only inferior to the Great Fire of London in 1666, commenced on Saturday afternoon, June 22nd, 1861, at Cotton’s Depot Wharf, on the Surrey side of the Thames, near London Bridge, which is utterly destroyed, as also all the immense Bonded Warehouses belonging to Messrs. Scovell and Co., and many very extensive waterside premises adjoining, with the ships alongside, extending for at least a quarter of a mile down the river, including also numerous dwelling-houses in Tooley Street etc. etc. The colossal warehouses were filled with every variety of goods, among which were many of a highly combustible nature, which, igniting, exploded with awful crashes, lighting up the vast metropolis and country round for thirty miles. It was during one of these fearful explosions that Mr. Scott and the gallant Mr. Braidwood were crushed to death by the blowing out of a stupendous wall. Many other loved have been lost. The fat and oil ran like molten fire into the stream, and for a long time threatened with destruction the numerous vessels in the Pool. The scene altogether was of the most fearful and terrific description. The burning ruins have continued to smoke and blaze for several days and nights, while hundreds of thousands of people from all parts of the metropolis gaze on with wonder and awe. The destruction of property is valued at upwards of Three Millions sterling. This view was sketched by an eyewitness and published by Read and Company on June 28, 1861. Good. Edges show wear and damage with minor cracking and chipping of paper. Loss near top margin. Minor foxing.